Amie Lieurance was a stay at home mom of three young daughters. At age of 35, she discovered a lump in her breast. She had never had a mammogram before. The radiologist used the words “worried” multiple times as she lay on the exam table. Within 24 hours of getting an ultrasound and biopsy, the results were Stage 2 breast cancer. Amie underwent a bilateral mastectomy. Her tumor was 6.2 cm, a pretty large size for her small frame. She took the oncotype test. The results came back with a score of 12, so she elected not to do chemotherapy. She received 33 doses of daily radiation which she finished in early March 2016. 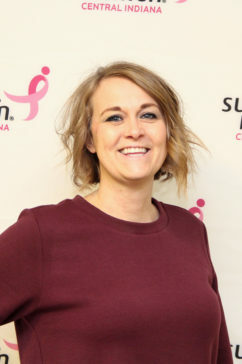 Amie is an advocate for breast self-examinations as her own self-exam saved her life. She now posts on Facebook monthly for others to remember their self-exams as well as knowing when their body changes. Amie’s first race team, Amie’s Hooter Helpers, consisted of 56 participants. The team raised more than $3,000 and made the Pink Honor Roll.